Preheat oven to 350 degrees. Beat together shortening and both sugars until creamy. Add vanilla, orange zest, cinnamon, nutmeg, salt, baking soda, and egg, and mix until combined. Add oats and water, stir thoroughly, and then add flour and mix just until combined. Stir in the chocolate chips and cranberries. Transfer mixture to a 9×13 pan, either lined with parchment or coated with cooking spray. Bake for 29-33 minutes, or until bars are set on top and starting to brown. While bars are cooling, beat together cream cheese and butter for 2-3 minutes, until fluffy. Add powdered sugar, one cup at a time, and orange zest, mixing until combined. Melt white chocolate, either in the microwave or over a double boiler. When chocolate is melted and smooth, add 3/4 to the frosting and mix to incorporate. Spread a generous layer of frosting over the bars. 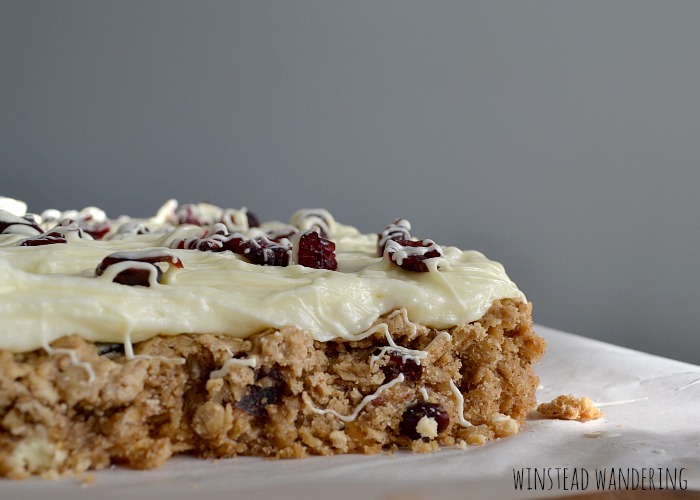 Sprinkle dried cranberries over the top and drizzle the remaining white chocolate over that. Allow chocolate to set for 30 minutes before cutting and serving. Note: the chocolate will likely harden a little as it sits while you spread the frosting. If that happens, heat it again until it’s smooth. If the chocolate doesn’t seem to get thin enough to drizzle, you can add vegetable oil, half a teaspoon at a time, until it drips easily from the tines of a fork. Do you love homemade versions of restaurant classics? Check out these copycat Red Lobster cheddar biscuits. For mouthwatering photos right in your newsfeed, don’t forget to follow Winstead Wandering on Facebook! Thank you, Tayrina! Have a great week! These bars are perfect for winter! 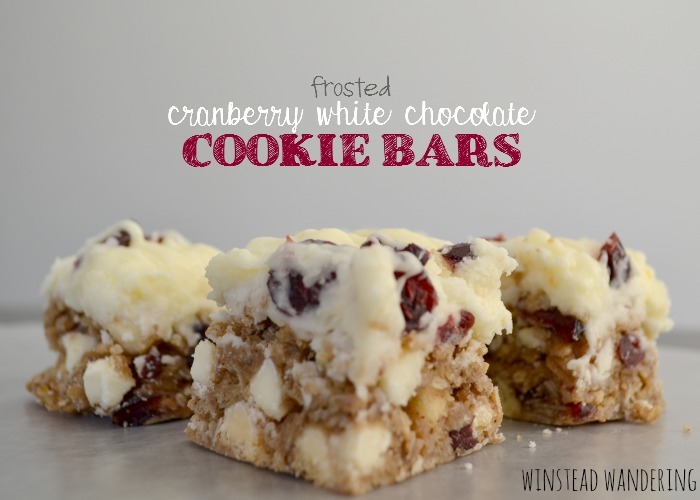 I love the combination of white chocolate and cranberries. Yum! Thanks, Jenna! You’re right, they’re a perfect cool-weather comfort food. It was, Chloe! With cream cheese and white chocolate…yum! These look soooo beautiful and tasty! Thank you, Elizabeth! They really are! Wow! These look absolutely amazing! I am so excited to try this out! I just love white chocolate and dried cranberries, the best duo! Thanks again! Thanks, Amanda! I don’t really care for that combo usually, and I love these, so I know you will, too! Oh my goodness, those look so decadent and yummy! These look GORGEOUS, and I bet they taste as good as they look, too! I’m not the biggest white chocolate fan, but I’m intrigued with this recipe and cannot wait to give it a go because I love me some cranberries in desserts! Hooray for sweets like this! I normally choose dark chocolate over white, no contest, but these bars are magical. You’ll have to let me know what you think! Cranberry and white chocolate is the best! And I always love cookie bars since they’re so much faster than making individual cookies. Thanks, Stephanie! I agree, cookie bars are the way to go, especially if you’re adding frosting. WOW these look delish! Pinning for later! Thanks, Erica! Have a great night! I don’t know, Abby… I’m totally not the cooking type, but you’re making me want to bake! Lol… Have an awesome week! These would be a good place to start; they aren’t difficult at all!